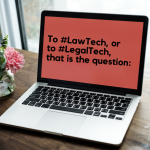 How has coding helped you as a lawyer? An appreciation for the gap between developers and management, and how I could close the gap. What challenges stood in your way when learning to code? It can get really boring at times! A failure to pick my battles, and learning the correct technology in the correct order. What approach have you taken in learning to code? Books: The Lean Startup (by Eric Ries). This book should be required reading for any entrepreneur! What advice would you give to someone wanting to learn how to code?